After moving to Denver, CO and spending a year as an Assistant Brand Manager at DISH Network, Evan returned to RSMG where he previously worked from 2009-2012. 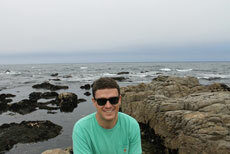 Evan’s role at RSMG includes the day to day account management for key clients including Wendy’s, Old Spice, and Tide. Evan has a critical role with the accounts he manages in the creative and strategic development process as well as working closely with agency partners to ensure proper use of respective sports property marks. Evan is a proud graduate from the University of Louisville and lives in Denver with his wife Allison.